In my previous posts I have shown how Matlab’s semi-documented uitree and uitreenode functions can be used to display hierarchical (tree) control in Matlab GUI. Today I conclude this mini-series by answering a reader’s request to show how checkboxes, radio buttons and other similar controls can be attached to tree nodes. % create a tree model based on UITreeNodes and insert into uitree. % icon being a qualified pathname to an image to be used. An alternative is to create a custom tree Java class and/or a custom TreeCellRenderer/TreeCellEditor. Specifically, to change the icons of each node you have to implement your own java component which derives from DefaultMutableTreeNode. Note: Matlab’s CheckBoxTree does not have a separate data model. Instead, it relies on the base MJTree’s model, which is a DefaultTreeModel by default. JIDE’s CheckBoxTree does have its own model. This concludes my uitree mini-series. If you have any special customizations, please post a comment below. This is great. Is there a way to apply a filter to display only certain file types when using the tree for a file system? @Mikhail – the link you posted is to a TristateCheckBox class, not a CheckBox tree. I plan to write an article someday about Matlab’s internal tri-state checkbox classes. Being internal and available in Matlab out-of-the-box, they are more useful than 3rd-party classes. @Amy – filters are not available by default in uitree, but you can trap the node expansion callback function to implement this relatively easily. @Mikhail – as promised, I posted the tri-state checkbox article last week. It took me over a year from your comment, but I guess that it is better late than never, right? Thanks for your great entry. I really like jave based checkbox tree. Do you know how to callback in java based checkbox tree? Thanks again for the great post. I’ve been playing with jtrees a lot lately and could now really use some customization of the Drag and Drop behavior. So, here’s a vote for a post on DnD. How do I get the information which checkboxes are checked when I use com.mathworks.mwswing.checkboxtree.CheckBoxTree? i have a question about how to hide the Root. just like a file system directory, use this method i can just display the files in C:\, how to show the files in D:\ within the same tree? @Rex – I’m not sure you can using a simple single command: “My Computer” is not really a valid system folder. However, you can setup two tree nodes, one for C:\ and the other for D:\, and display them in a uitree. It’s not as simple as a one-line command, but it’s not very difficult and it will do what you want. I am an antenna engineer. I want to design a GUI to manage my antenna pattern data. I realized a tree i need with actxcontrol about 4 years ago. This tree inluced some icons, i integrate them with a ActvieX Dll design with visual basic to load the pictures. But according to your blog, i think using VBScript to load the image is more effective. @Rex – the previous article in this series described how to create a custom tree. However for the second event we did not manage to find a listener. @Amjad – there are several callbacks that you can use – all of them directly on the jCheckBoxTree object. Specifically, your best guess would probably be MouseClickedCallback. Also, take a look at the related ClickInCheckBoxOnly boolean property. I know this post was from some time ago, but perhaps you can help me with a minor callback issue I face now. I have created a CheckBoxTree using Yair’s second approach (using the built-in classes from com.mathworks.mwswing.checkboxtree.CheckBoxTree). I would like to take action after selection or deselection of an item in the tree. Warning: Possible deprecated use of set on a Java object with an HG Property 'MouseClickedCallback'. Is there a way: (1) to set the callback function more elegantly, so that the warning is not shown anymore, or (2) suppress the warning (I don’t know the message identifier). First, thank you so much for your entire website. This is a real bible for making interfaces in Matlab. I am using uitree in one of my program and everything you posted about is working. 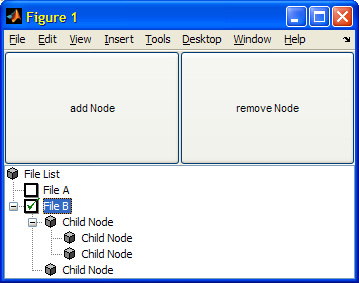 I am trying to be able to draw a rectangle on the tree to select multiple nodes (like what you can do on the listbox). I was wondering if there was a simple Java property to change to allow this that you were aware of. I can’t find it. great to follow all your postings, even if I have difficulties to understand the details of connections/interface between Java and Matlab. @Domenico – you need to create a dedicated Java cell renderer class, compile it using a Java compiler, and then set your tree to the new class. If you’re not comfortable with Java, you can use a workaround such as the one that I’ve shown for context-menus. I’m trying to make a tree lazily expand based on a very complicated data model that I have already coded (a bunch of classes that are built in a tree). The expansion of every node depends on the data that the node contains, and I store this data in the UserData field of the uitreenode. However, if I just click the [+] icon, the expansion function gets called but the node isn’t selected. How can get the node that is being expanded in the callback? I couldn’t find any function in the Jtree or the UITreePeer that would do that for me. Also, I don’t think I can make any use of ‘value’ because in my implementation it’s just a string (I can’t cast my classes into handles; or can I?). @Yishai – place your code in a function and attach this function to the uitree’s NodeExpandedCallback. This callback function gets the node handle in the second input parameter. Note that uitree‘s help section (in uitree.m) incorrectly calls the property ExpandedFcn, whereas the correct name is NodeExpandedCallback. If you make this change, you can use the example in the help section to see a sample node-expansion callback function. I didn’t see your reply when I posted. I guess both solutions work, but I already had everything written this way so I stuck to it, just changed the way I get to the UserData field. 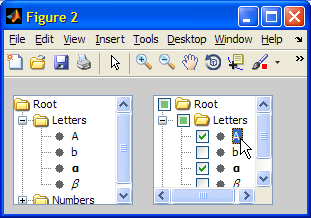 I have created two matlab GUIs, GUI A has a tree view by using uitree and GUI B has a button which be able to modify the tree view in the GUI A. But the problem is that the GUI B can not get uitree handle by using general passing data method among GUIs. Yair, Thank you for your help, you are always right! Also, i am creating the tree inside a for loop, since it must be dynamic based on different data. There wasn’t any way i could see of moving through the tree in matlab (such as starting at the root, moving to the housed nodes, etc.) which i thought i could possibly use and determine each checked state individually…but cannot. @Natalie – I don’t have an immediate answer, but I’m pretty sure that it can be done using a combination of properties/callbacks. If you’d like me to spend some time to investigate and solve this for you (for a small consulting fee), please contact me by email. I have a super basic question here. I’m very new to Java but have been working with MATLAB and its vanilla flavor GUIs for 10+ years. My goal is to create an interactive plotting tool to display waveforms depending on if its node is checked or not. I see that this contains all of the information I am after (it tells me which node has been clicked) but I am at a loss as to how to get at it. I would love it if I could get a MATLAB structure or even a string of the above treePath. So, how do you suggest to do this and where can I go to read up on how to do this right? Now, I can parse the string with regular expressions. Please point me to a better way. Quick question I hope. I have a that built off a folder structure, and anytime the user inputs a new file I’m deleting the uitree and creating it again using the uitree(‘v0′,’Root’,'[directorypath],handle.panel) method. However this causes me to have to expand through the tree and set some custom icons and also have to do alot of leg work to put the tree in the same state collapse wise. Is there any easy way to update the tree so that if new files/folder exists they are just there and I dont have to create it new everytime? Thanks in advance, and thanks for this site and the Book. You can add/remove specific nodes in run-time. See the previous article of this series, or in my book (section 4.2) for details. Do you know of a way to save the checkbox tree? I have created a very large tree in my application and I would like to load it from a file each time rather than having to re-create. It appears that the nodes cannot be serialized during save. Can you tell me what code should be written to find file location. I have created a CheckBoxTree using Yair’s second approach (using the built-in classes from com.mathworks.mwswing.checkboxtree.CheckBoxTree). Also suggest me where it should be added inside that code. I am using example of http://undocumentedmatlab.com/blog/customizing-uitree-nodes-2 ‘built in classes’ example. I am using it because I want tick as per how it is mentioned in the output of that code. Now if I want to get file location using the same format I am unable to do so. I did try with slight editing in the words (instead of tree I wrote JTree as the example code uses ‘JTree’ and not just ‘tree’)..
No appropriate method, property, or field getSelectedNodes for class com.mathworks.mwswing.MJTree. kpmandi – I already suggested that you contact me by email for paid consulting. Please stop posting questions here again and again. This is my website, it is NOT a general Q&A forum. Hello, first off all thanks for the great Work. I am using the CheckBoxTree as explained above. But iam not sure how the tree is actually working and couldnt find any helpful informations on other sites. How can i update the tree after initializing? Is the jTree or jCheckBoxTree my main object? jCheckBoxTree.expandPath(..) works for me. Since i am using CheckBoxTree, your information about the uitree doesnt seem to help. But i am still not able to delete the root node. Neither jCheckBoxTree.removeAll nor jCheckBoxTree.removeSelectionPath(nodeRoot) works for me. I have been looking into the Matlab implementation of the CheckBoxTree (com.mathworks.mwswing.checkboxtree.CheckBoxTree). The problem I’m facing is that whenever I click the Label (e.g. like in the last figure of the article, where “A” is clicked), the state of according checkbox also changes. What steps do I need to take to prevent the CheckBox from getting changed when clicking the label? @Sebastian – I assume that you can get the click location from the callback’s eventData parameter, and thereby decide whether or not to rever the checkbox state. Or maybe there’s an option in one of the object’s properties to modify this behavior. If I using DefaultCheckBoxNode to create CheckBoxTree and I want to change the icon of the leaf and still having the checkbox on it. How do I do it ? I just created a tree using ui.extras.jTree and I need to count the number of nodes under each parent node. There seem to be no method corresponding to getChildCount() as in JTree. Any help or tips? First of all, great article. I need to create a CheckBoxTree using com.mathworks.mwswing.checkboxtree.CheckBoxTree. However, I need to customize the icons and when changing the CellRenderer in the original MJTree, changes don’t apply to the CheckBoxTree. Could you please tell me how can I achieve this? I tried modifying the CheckBoxTree’s CellRenderer, but it says that there’s no ‘setLeafIcon’ for CheckBoxTreeCellRenderer. @ACenTe – this would probably require creating a custom CellRenderer class in Java. Email me for private consulting on this if you are interested. A big respect for you and your website. Really helpfull! Is there a possibility to speed up things? Maybe by extracting a small tree from a larger tree? 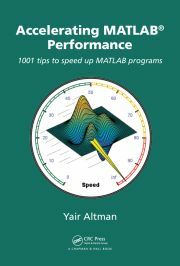 @KhRaIf – there are several ways in which you can speed up your Matlab code. In general, you need to run the Profiler and see where the performance hotspot is, and try to optimize that. One general idea that could help is to create the tree model first, and only then to attach it to the tree, rather than updating a visible tree one node at a time (which is much slower since the tree needs to refresh after each update). Also, updating an invisible tree is faster than a visible one – you can make it visible when it is ready. If you still need additional assistance, email me for private consulting. this is an incredibly cool resource as all your stuff. I’m using the com.mathworks.mwswing.checkboxtree.DefaultCheckBoxNode and would like to set the state of the check boxes programmatically. I know the getSelectionState property that works fine for me. No method 'setSelectionState' with matching signature found for class 'com.mathworks.mwswing.checkboxtree.DefaultCheckBoxNode'. However, this unfortunately does not update the parent selection boxes. Is there any method to re-validate the whole selection state of the jtree? I am using the Matlab built in class (com.mathworks.mwswing.checkboxtree.CheckBoxTree), how do I get a list of which nodes have the check box marked? …from the built-in class example I get a list of the highlighted nodes, not the checked ones.